Is it going to take the NFL's iron fist to get CNBC's Money Talks cancelled? Is it going to take the NFL’s iron fist to get CNBC’s Money Talks cancelled? Last week over at The AP Party, I wrote about CNBC’s The Profit and how it’s kind of a hot mess, but a key cog in CNBC’s successful prime-time revamping. Although not part of that ratings lift, another part of CNBC’s diversification away from pure stock market drivel is Money Talks, a “reality show” about a Vegas based sports betting consulting company. The show actually filmed last fall and had a 1 episode teaser before reappearing last month. Upon its announcement and debut, Vegas insiders and the web in general flipped out for a variety of reasons. The most common complaints were that the show’s protagonist, Steve Stevens, is convicted of telemarketing fraud, changed his name and even recently lied about when these crimes occurred. He’s also a complete unknown with no track record or reputation within the industry, blatantly lies about his betting win percentage, and was on the air because of some ties to Floyd Mayweather. If you’d like to read further, by all means dig in to the links below. Wagering Minds- CNBC To Air Primetime Show About Sports Betting Called ‘Money Talks’, Does It Star A Convicted Felon? You’re not going to find many articles defending Stevens or his company or CNBC’s decision to air the series although you may find some suspicious anonymous and often profane comments defending Stevens on some articles which are similar to the documented entertaining e-mails Stevens has sent SportsGrid’s Matt Rudnitsky. So despite all the noise that was made in the fall when one episode aired, I decided to give the show a shot. Despite the laundry list of reasons why this show really shouldn’t be on the air, it could potentially be at least entertaining right? There is a lot of disingenuous crap reality TV (although usually not on financial news networks), so why not give it a try? The show actually isn’t that bad if you’re looking for some fluffy guilty pleasure reality TV. Stevens is a decent protagonist (not knowing his background of course). The shows flows pretty well with usually 3 plots per episode that usually include a VIP client in town to win some money, some work/home issue for Stevens, and an underling having to service a newer client in town to make some money. With that said, I have no idea how and why this show is on television. One theory that comes to mind is that since CNBC already bought this show and had an entire season, they are airing existing episodes to fill a hole in their schedule to play out the string. Networks like FS1 and others have begun to talk a bit more about betting of late and there’s even a little known show on Friday nights on some random cable channel that has 4-5 really haggard looking Vegas sports betting guys drinking booze out of plastic cups smoking cigarettes talking on set talking about what games to bet during football season. I love any show that brings your AM dive bar crowd to your living room. But Money Talks goes way way beyond what I think most are comfortable with on a lot of fronts and that’s coming from a guy who will bet on anything and everything. At times, the show definitely glamorizes gambling on sports making it look like easy money for those who as they say on the show “have the balls to bet big”, which as most know is FAR from reality. 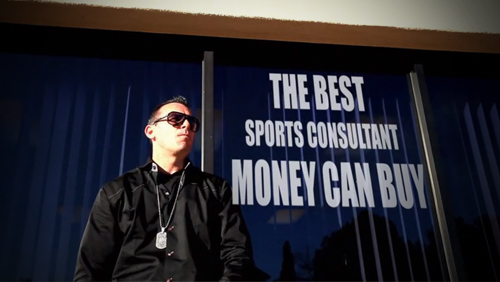 There are fancy cars, pretty girls, fun nights at the bars, private jets, and other elements that make the sports gambling life look like somewhat of a Hip Hop music video. While it’s somewhat troubling that the sports betting lifestyle is being glamorized, I imagine there is equal concern that the show does indeed show the dark side of the gambling. One episode features a drunken friend of two new really douchey clients giving one of Stevens’ underlings gruff about a losing wager he suggested. The underling’s reaction? Get into a fight with an entire group of individuals at a bar. Isn’t betting on sports awesome! There are also an awful lot of scenes of binge drinking and cigarette smoking watching sports or talking about sports and while again this falls into an occasional weekend for me, I find it pretty damn bizarre that there seems to be a good amount of driving right after pounding shots and cocktails in several episodes. Isn’t betting on sports, chain smoking, and drinking and driving awesome! From cheesy/shady sales calls to perspective new clients, forceful bullying of clients to wager larger amounts, and like this clip below- cussing out teams and players for not covering a spread, there is a wealth of scenes for leagues, teams, and schools to be concerned about. I can see why more legitimate industry personalties loathe the show. For an industry that many including myself believe should be legal, Money Talks is detrimental to that movement and public opinion on sports gambling in general. While the majority of action is placed on football, both college and pro, there have been baseball wagers as well. In addition to those leagues, I’d imagine the NHL was probably thrilled that a Wednesday OT playoff game went from a game winning goal to a Money Talks episode in a matter of seconds. The case against Money Talks is pretty strong and even stronger considering CNBC is supposed to be a bit higher on the reality TV nonsense totem pole than say Spike or truTV. But despite all of this, if it’s good TV, it gets ratings, and nothing is really illegal, can anyone actually do anything to squash the series? Clearly the loud chorus of writers bemoaning its existence has had no pull with CNBC. Many will recall when the NFL stepped in about a decade ago and told ESPN that its dramatic series, Playmakers, about a fictitious pro football team in a thinly veiled NFL, was too antagonist to the league and the league strongly urged the network to not renew it at the risk of affecting their business relationship. But that was ESPN and people actually watched Playmakers opposed to CNBC and nominal ratings for Money Talks. That said, this is the NFL we’re talking about, the institution that pretty much bulldozes anyone who gets in its way whether that be a cable company, their own players union, other pro leagues, networks, and cable channels. Hell the NFL could even imply giving the much loved Sunday Night Football a dud or two a year to hammer the point home. Trust me, the mere suggestion that NBC could be airing a Jaguars vs. Bills game on Sunday Night would lead to a definitive cancellation almost immediately. But for now CNBC seems fine tempting fate with Money Talks and I can’t help but stare. It’s like a game of Jenga where the tower is wobbling and the whole thing should have already imploded. Will the NFL have to kick the table or will they just wait it out hoping it will blow over without having to intervene. I’d wager (TAKE IT TO THE BANK, THIS IS A 100% WINNER THAT YOU HAVE TO GET IN ON IF YOU HAVE BALLS) that Money Talks is winding down. It would defy all logic if it returned especially considering the ratings. But until then, it’s fun to wonder what, when, who, and why will finally topple this ill-conceived idea.